Crayon Box Quilt Studio: Giveaway Day! I know that I do and every so often I actually win one. It is Sew Mama Sew's Bi-annual Giveaway Day! A great big giveaway party. An early Christmas present for you. 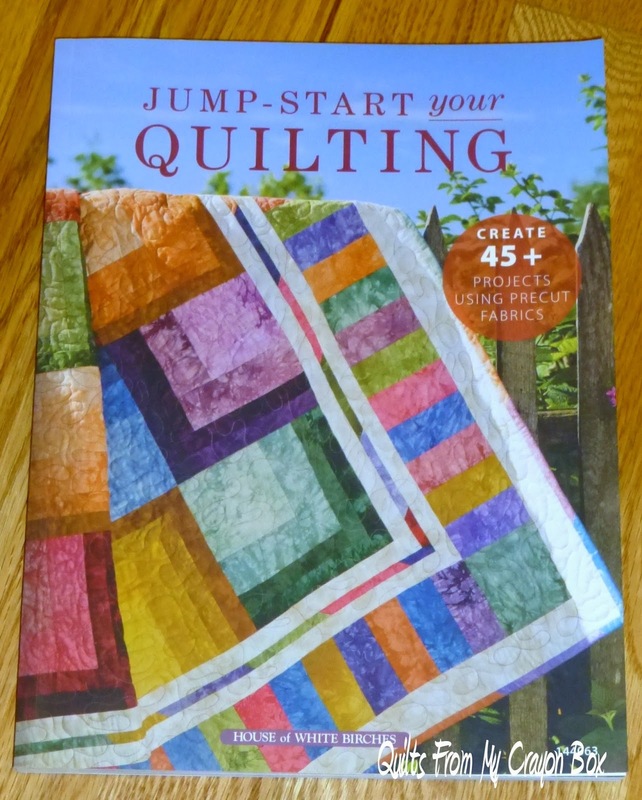 I am giving away a copy of Jump-Start your Quilting. It is a great book filled with really terrific projects, all using pre-cuts. How can you win this fantastic book? One entry only per person and just tell me of all the new fabric lines coming out soon (not ones that are actually available now), tell me which one (and only one) that you just have to have. I have 3 that are must haves for me and can't seem to narrow it down to one pick but I'd love to hear what you're just dying to get your hands on. Entries will stay open until Midnight Friday, December 13th and I'll announce the winner over the weekend. International entries are welcome. Please, please remember to add your email address in your comment if you are a No Reply Blogger. I had so many entries during my last giveaway that were NRBs without email addresses that I had to remove them from contention and I'd hate to have to do that again. Good luck and have fun hopping around to all the other blogs offering up goodies this week. Color Me Happy by V and Co. is top of my list. Mirabelle by FigTree, I always LOVE Joanna's fabrics and colors, I can't get enough! Tpott@optonline.net thanks! I am so out of the loop on new lines of fabric. I have a huge stash and I am on a no buy diet. Really, one, just one?!? 30's playtime has a sequel that I'm not going to let pass coming soon. Botanics is high on my list! Thanks for the chance to win a giveaway! Hard to choose...there are always sew many beautiful choices...just ask my stash!!!!! April Showers by Bonnie and Camille for Moda looks so wonderful. I'd probably have to go with Color Me Happy by V & Co (but I'll be honest that I don't know a lot of the non-released fabric lines). I am awaiting Sphere to come out - there are some great prints in that line. I like the Downton Abbey fabrics - not available locally yet. I am awaiting the new Tilda fabrics. I wish I wasn't on a budget : ) I am just completing my very first quilt, so this book would be a very amazing win! Can't wait for Mormor by Lotta Jansdotter for Windham Fabrics. I would have to go with the Downton Abbey fabric line. I am actually waiting for two fabric lines: Kate Spain's Daydream and Joanna Figueroa's (Fig Tree) Mirabelle. Mirabelle by Fig Tree. Just love her fabrics and the colors she uses. I am on a fabric diet this year, but I do like the Downton Abbey fabrics. I love the new Handmaids. They are supposed to be in stores very soon! Thanks for the giveaway! Star Spangled by Doodlebug for Riley Blake Designs. I love to watch for the new Riley Blake Designs...any of them!! Oh Mormor - so, so beautiful! Absolutely, whatever Kate's next new line is!!! I have already preordered Cat Nap by Lizzy House. I'd like the next new line by Primitive Gatherings. Chance of Flowers by Sandy Gervais - gotta have it. Thanks. I want to get my hands on Mormor by Lotta Jansdotter! I'm mostly a garment sewist, so I don't know the quilting fabric lines well enough to comment. Sorry I can't help in that regard! The Riley Blakes look fun!! April Showers by Bonnie and Camille!! I must have this fabric!!! I love everything about this line!! April Showers. Love Bonnie and Camille's fabric lines. Thanks! Kate Spain's "In From the Cold"! I;m looking forward to Mormor by Lotta Jansdotter. So pretty. Thanks for the chance to win such a useful book. I love precuts. Color me Happy from V & Co. Thanks for the chance. I have to have 30s Playtime by Moda. Thanks for the chance! I would love to have 30's playtime too! THanks for the chance! Wee ones by Sarah Jane. Always love her fabric! I'm not really sure yet but I usually like Art Gallery Fabrics so it'll probably be something from them. Mormor, by Lotta Jansdotter. I just heard of it yesterday. It is so pretty! Color my Happy from V and Co for Moda! The Charley Harper ones. They've not made it over to the UK yet so I'm hoping they count! Hoffman New Bali Batik that were shown at 2013 Fall Market they look beautiful. what a wonderful give a way. Thanks for the chance. I am new to all quilting, and so am on a budget so I don't even tempt myself and look. So I am afraid I have no idea. I am looking forward to In From the Cold by Kate Spain. Mad Mend. Definitely Mad Mend! Mormor is the one I am looking forward to arriving. I have one favorite so far. That would be Impanema from Birch Fabrics. So festive. Love the colors and designs. Looking forward to Aneela Hoey's new line! I would love Daydreams by Kate Spain! I really don't follow fabric lines. I know terrible! The only thing I can think is Jeni Baker's new line. Can't tell you the name, but I saw her post about it and it was super cute! Daydreams by Kate Spain. Thanks. Up, Up & Away from Cloud 9. This book looks fun. Thanks! Robert Kaufman Artisan Batiks - Elemental Stripes. Thanks for a Great Giveaway! Gosh, I am out of the loop as I don't know any of the new fabric lines coming out... sorry! That book looks amazing, though... just the inspiration I need to start my first quilt! I, too, am out of the loop. :( but I love French general and am sure they must be having something special coming up. for me it's Mormor by Lotta Jansdotter but we have to wait much longer over here! I am really excited for Lizzy House's Catnap, I really to stock up on the butterfly fabric in it that will be re-released! I am looking forward to Tula Pink"s new fabric it is called fox something I just know I saw it on line I don't care what it is called I want it. I try not to look at the new fabrics coming out...I have enough trouble with the fabrics that are out now! LOL! Absolutely, hands down - April Showers by Bonnie and Camille! Chance of Flowers, though it is hard to pick just one. Thanks for the chance. Already bought the Downton Abbey fabric. I don't know the name but I love all things Bali prints. I just saw MadMend by Cloud9 and it would make perfect notions bags with clear windows. Must have it! Trail Mix Cottons by Riley Blake. Anything by V & Company like "Color Me Happy"! OR Kaffe fabrics!!! Want all of them! You? Bonnie and Camille's April Showers! Thanks for the chance. Color me Happy by V&Company... loved it when she first gave sneak peeks on her blog! Mormor by Lotta Jansdotter for Windham Fabrics. I'm trying not to pay attention to the new lines coming out because I'm trying to use my stash and buy only for specific projects. I'd love to have some Babar by Camelot Cottons. He was my favorite as a child. I'm loving the lotta jansdotter new line coming out!! Definitely Mormor by Lotta Jansdotter. Thanks for a great giveaway. I can't wait for April Showers by Bonnie and Camille as I love all of their fabric. I can't wait for april showers either! There are just way too many I love to just name one! Daydream by Kate Spain would be on my list. I love 30s Playtime!!! Thanks for the chance to win! Birch Fabrics Acorn Trails looks very cute! Riley Blake 108" wide backs...Thanks for the chance! Botanics by Carolyn Friedlander and Mormor by Lotta Jansdotter. I'm a horrible quilter person, but I have no idea what fabrics are coming out, or for that matter are out now. I've been trying to be a good girl and staying away from quilt/fabric shops to save a little money. Daydreams by Kate Spain. Thanks! I'm looking forward to Color Me Happy By V And Co. For Moda Fabrics. I can't wait to get my hands on Zen Chic's next fabric line - I think it's called Sphere. april showers will be a nice set. I'm waiting for Chantilly by Lauren and Jessi Jung, those colors are wonderful. Daydreams by Kate Spain. Beautiful color palette. I'm excited about daydreams by Kate Spain.